The venue will be announced….. Invite great masters like Guru Sankha Chatterjee, Zakir Hussain Ji et al. 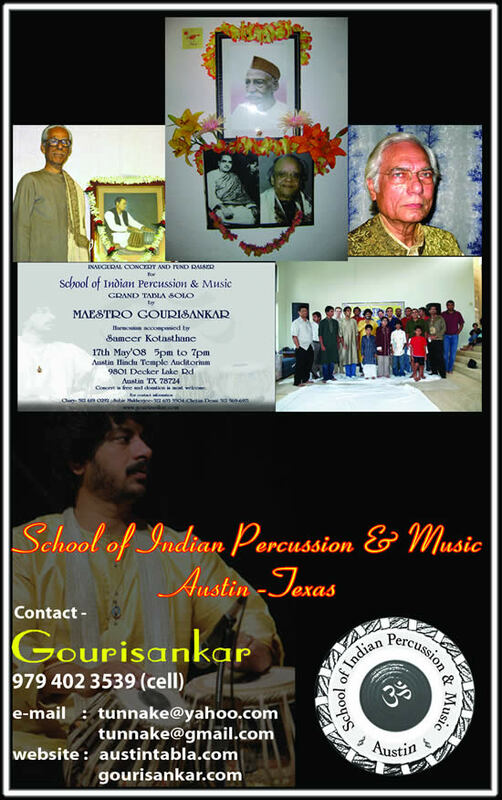 It is a great pleasure for me to know that Sri Gouri Sankar Karmakar, my son and one of my most eminent desciples, is going to open a Musical Institute in Austin . On this auspicious occasion, I most humbly remember our revered preceptor, Late Ustaad Keramatulla Khan Shaheb and wished his blessings be showered on this Institute to make each one of its disciples eminent career to provide the heavenly pleasure of Indian music to millions of music lovers all over the universe. 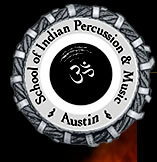 I am happy to know that my dear disciple Gourisankar has organised to open school of Indian music - naming 'The Austin School of Indian Percussion'. In India the Guru Sishya (disciple) relation is same as father and son and I love Gouri as my own son. We (me and his father) affectionately call him Madhu which is more intimate to me than Gourisankar! My heartiest blessings and good wishes will be always with Goursankar and his friends who are assisting/helping him to build up an Institution to study TABLA in proper way. I pray to God for the success of the school.